My friend Amy gave me this recipe. She told me these cookies are amazing and she was right! They’re gorgeous too. Also, they’re super easy to make! 1. Mix all ingredients together, using an electric mixer if possible. 2. Roll dough into tbsp sized balls and roll in powdered sugar. 3. Bake in a 350 degree oven for 10-12 minutes. 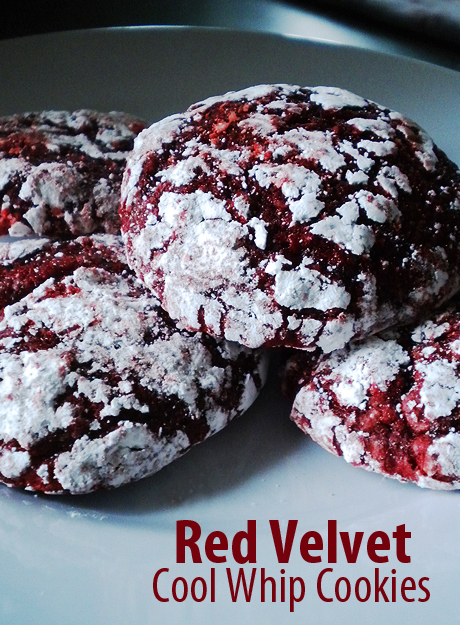 This entry was posted in baking, dessert, holiday and tagged baking, cookies, cool whip, dessert, holiday, recipe, red velvet. Sounds excellent. I will try these tomorrow after I go to the grocery store.